GRC Porticos - Abbey Artstone Limited, Manufacturer of Architectural Masonry, Semi Dry, Wetcast, GRC, GRP, Cills, heads, balustrade. layout arrangements. 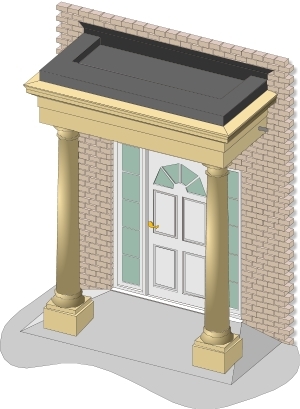 Added to this are four different columns with two different column to beam details giving you a possible 96 different combinations and looks of portico to suit your needs. The porticos are cast in a mere six units making it achievable to erect a GRC portico in as little as 1 – 2 days which saves considerable time in comparison to standard pre cast portico construction. All or porticos are designed by professional engineers with numerous years of GRC experience and as such are backed by a certificate of quality assurance ISO 9000 and are manufactured in accordance with the Glass Reinforced Cement Associations approved manufacturer scheme. Any portico ordered comes complete with all the fixings which are required for construction and fully details drawings showing the general arrangement, individual unit drawings and positions for fixings. Not only this you will also be provided with a full method statement for fixing the units and our technical team in the office backs this up to ensure your portico installation goes as smoothly as is possible. Post fix design reducing the amount of damage which can occur prior to the structure completion. Ultra thin and lightweight units reduce labour and mechanical lifting in both time and cost. Very little demand on the structure to which it is attached. High resistance to water absorption. We have a wide range of Beam and Column combinations to suit all designs. However, we can also manufacture to customers specific designs although careful thought should be given to pattern and mould establishment costs and utilization of them by ensuring you make full use of quantity where possible.